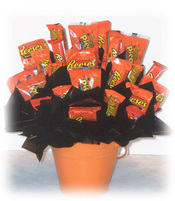 Here you will find all of our Unique Candy Bouquets. Any of these tasty gifts can be customized to your specifications. If you have any questions regarding any of our Candy Bouquets or would like to customized a Candy Bouquet please contact us by calling us directly at (419) 937 -2451. Know someone who needs a smile? This ceramic smile is guaranteed to brighten someone's day. Filled with an array of assorted candies from Hershey, M&M Mars and Nestle this gift is sure to put a smile on the face of whom ever receives it. A peanut butter lovers dream, our Ultimate Peanut Butter Bouquet is arranged with a grand assortment of Reese's Peanut butter candies. This distinctive bouquet is sure to catch everyone's eye. This is the perfect gift for those with a passion for peanut butter. Created specifically for the M & M Lover, this unique one of a kind candy bouquet has an edible candy base, using 4 theater size boxes of M & M Candies, we created this one of a kind M & M Candy Bouquet. Filled with Both Plain and Peanut M & M's This gift is sure to leave a lasting memories and put a smile on the face of anyone who receives it. This gift is available with your choice of a plain or peanut M & M base. 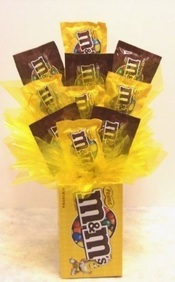 The base of this bouquet can also be done in Plain or Peanut Butter M & M 's Please choose your option when ordering. Looking for a great birthday? The look no further! This bouquet is sure to put a smile on anyone's face. Our Birthday Blast candy bouquet is packed full of today's all time favorite candies, over 2 pound of sweets! Packed full of chocolate favorites from Hershey to M & M's, and everything in between. And no birthday gift would be complete without party horns so we accent this grand gift with two of those.